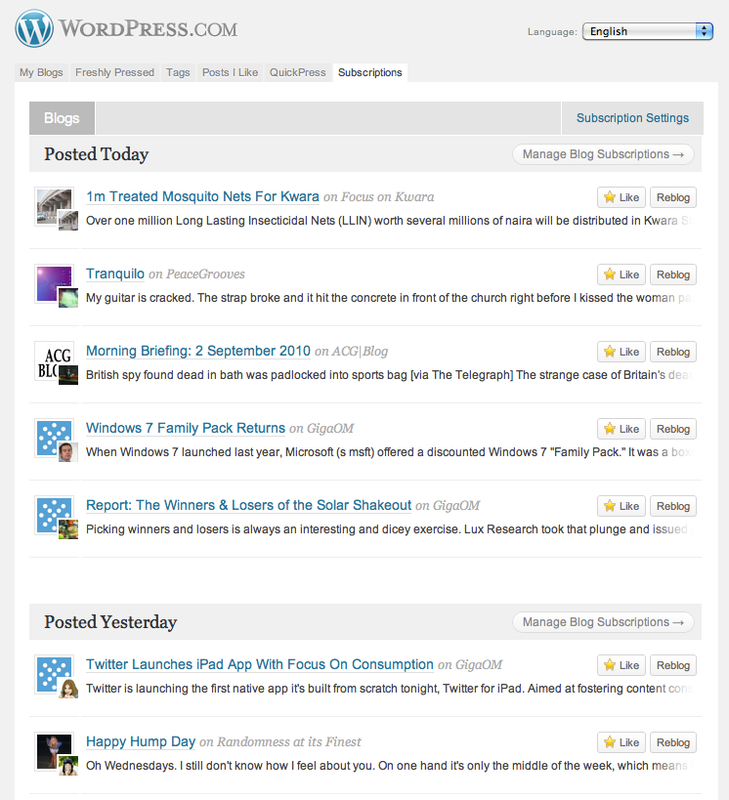 Keep track of posts across multiple blogs with the subscriptions reader. Do you have trouble keeping track of all the blogs you read each morning? You may use RSS feeds to keep track, but those can be tricky to manage for a non-technical person. You may also open multiple tabs and scan through every blog, but that becomes difficult with a large number of blogs to read. Let’s face it, keeping up to speed with multiple blogs is tougher than it should be. To solve this, today we’re introducing a new subscriptions feature to WordPress.com. Subscriptions are an easy way to track and read posts across multiple blogs, all in once place. Let’s say you’re reading a blog on WordPress.com that you really enjoy — so much so you want to be notified when new posts are published so you remember to read them. You can subscribe to this blog really easily by using the “Subscribe” menu in the admin bar. By going up to your admin bar, and clicking “Subscribe to blog”, you’ll be instantly subscribed and all current and future posts will be added to the subscriptions tab on your WordPress.com home screen. The next time you visit WordPress.com, if new posts have been published on any of these blogs you’ll see a “NEW” notification on your admin bar. This lets you know that there are new posts for you to read. You can now use the “My Subscriptions” menu to quickly access your subscriptions reader and catch up on all the latest posts. You can also head straight to your subscriptions by using the new subscriptions tab on the WordPress.com home screen. We’ve also brought email and jabber notifications all under one roof, so it’s easy to turn on email notifications of new posts, or get posts sent directly to you via instant messenger. Don’t worry, all of your existing email and jabber subscriptions have been ported through. Subscriptions are live and ready for you to use. We’ve put together a subscriptions support page that will get you up to speed and show you how to get started. Want Instant Delivery of New Blog Posts & Comments? Subscription ? I use Google Reader. Simply add blog’s URL and I’m subscribed. You should use the tools that work for you, if that’s Google Reader then awesome. We’ve designed this as an option for those users who might find handling feeds with Google Reader (or any other reader) difficult. Also consider that it’s not just a reader. We’ve added features that help you manage email and instant messenger notifications. The reader is just one of the ways be notified of and read new posts. so what is the difference between the subscriptions and the blog surfer? Excellent! It will save me a lot of time for sure!!! Thank you! You guys are Awesome!! Thank You! Keep the creativity coming! Brilliant idea. This trumps Google reader. All those things you push to front page are not very l10n friendly, something is translated, something not. It would be better if you would enable those features on locale front pages and then link to them based on users language (as you do now for other stuff, like link to support). We’re building these features for the English speaking users first to make sure they are tuned and working well. At that point we’ll start translating them fully and moving them to locale front pages. Cool! Any chance of a real “rolling” blog roll in which to showcase the subscriptions on our blogs? This is excellent! Thanks guys, your hard work and never ending development is the exact reason why wp is second to none! WordPress, you’ve done it again! This is my favorite feature that you’ve introduced in quite some time. Thank you for always bringing us new and improved ways to exchange our writing with the world! I’ve been using Blog Surfer to accomplish this. Does that mean that feature will soon be disabled? The idea is for the new subscriptions features to replace the surfer, but we haven’t finalized any plans for that yet. I like it but it looks too small, would be better more like Freshly Pressed – larger thumbnail and a bit more text not just a single sentence. I use netvibes, but great job! but what have happen to all the blogs i had in my Blogs Surfer??? will be so great to get back all those places i collected in the last two years…. We’ll look into adding an option to import from your blog surfer. Is there any possibility of subscribing blogs from “Blogspot” or “Sapo” (Portuguese)? This is pretty cool. Thanks a lot! Great feature. Too bad the blogs we already have on our Blog Surfer must all be visited in order to subscribe to them though. I was hoping there would be an integration. I’ll see what I can do to get those imported. Very nice – once again from you guys who are always adding options for us to try. We are better bloggers for it! seems like a neat feature. can we subscribe to private blogs? Yes you can, as long as you have access. So much better than having separate RSS feeds, blog surfer and email ways of “subscribing”. Now everything’s under one easy roof. It was a little bit of a nuisance manually moving everything over from blog surfer, but now it’s done… so much better! In order to a good location of WordPress.com , note that in other languages the tabs must be larger than in English. In mine, when be translated, there will be no space for more tabs. Even I’m not sure if this new feature will fit well in navigation bar when it be translated. Yes, the reader works with most blogs and websites with feeds. Love this new feature! Thank you! I never took to google readers and there’s so much great content on WordPress–now to figure out how to promote it and encourage my readers to use it too! I would like to know how I can add something to my blog that will allow other people to subscribe to my blog. I do not know how to do this. You do not need to add anything, users who are logged in will see the subscribe menu on their admin bar. One other thing: is there a way to “expand/collapse” each entry as you read down the list? It would save having to either click and then come back, or open each entry in multiple tabs. Very promissing, i’ll go check it out! Thanks, anything that makes it easier is better. hmmmm… I thought we already had this! This is great! Will there be a way to import from other blog sites? Possibly as a future upgrade. Wonderful; all efforts to improve the use of the Internet with less time are worthy of praise. Thank you for the continuous improvement of WordPress.com. Nice! This will make things a lot cleaner and organized. I really like this idea, but I am already set up with blog suffer. I don’t feel like starting over again. This is an absolutely terrific idea! Thanks! Looks great. What are the chances of getting our “Add To Blogroll” and “Random Blog” features back? Handy, this’ll be a most helpful feature when I start reading more blogs. Can’t the blogs that I have on Readomattic automatically just be on the subscription list? I have tons, and I just don’t want to do the entire list all over again. Yes, we’ll get this sorted out soon. this will make for an interesting tool, but I agree that subscribing in Google Reader is far more common (and perhaps preferred) for the moment. Sounds great, thanks for keeping WordPress fresh! As you say, RSS isn’t for everyone so more ways to subscribe are always welcome. I prefer RSS with my desktop reader but I am sure many people will make use of this. I would like to see a way to subscribe just to new blog posts, and not to comments – or replies to comments? fantastic post!!!! I’ll check it out…. What’s new beautiful but more should be improved, Admin Panel. I never got into Google Reader but I do collect my RSS feeds in Outlook. The only issue I have is that I can’t read them on different computers. This sounds like a promising solution to that problem. Looks like a great idea – would really like it if you can find a way of moving blogs on Readomattic over to subscribe without doing it manually. Thanks for continuing to improve WordPress. This is great! As someone new to blogging and not very techy I really appreaciate this. Thanks. The biggest improvement for reading convenience in WordPress.com. Thanks guys. Im just migrating from Blogger to WordPress. How do I make sure everyone who followed my blog there would be transfered automatically. Also, I will be publishing on my custom domain http://www.backpackigninja.com from the WordPress blog….. any advice? Our support system is currently closed until Monday, but please contact them when they reopen and they’ll be able to help you out. This is really nice on the part of wordpress.com. You are really offereing excellent services. Thank you, WordPress. Great! Anything to help me stay organized. This social media stuff can be overwhelming! Thanks Andy! Pingback: Terry Heaton’s PoMo Blog » Blog Archive » Death of RSS readers? I don’t think so. This is great, it’ll save me some time and paper (from writing down blog sites I want to remember). I’m not sure the scariness of RSS is the problem you need to solve here. I had no trouble figuring out Google Reader, but I can’t say I fully understand the distinctions between Blog Surfer,Tag Surfer, Readomattic and Subscriptions. If I’m struggling, then I have to wonder whether your ‘non-techie’ target users are going to fare any better. The Admin bar is getting crowded with the features related to bloggers who blog. My blog has external focus, I don’t have much need for features internal to the blogging community. But thanks anyway for introducing new features. That’s great. I just wish we could also subscribe to blogs on blogspot, typepad, etc. You can, just enter their URL. That’s awesome! Bloggers have one more reason to choose WordPress.. I usually use FeedBooks to subscribe to blogs because it works well with my Kindle e-reader. Request for clarification: Under the old email subscription system, an email subscription to a blog only sends emails of the primary posts, not the comments. To subscribe to comments it is necessary to make a comment to a primary post (or a reply) and check the box for “Notify me of follow-up comments via email.” and this needs to be done again for every primary post in order to get the comments for that primary post. Does the new system work the same way? If the answer above is yes, then I have a request for an improvement: Provide an option for an email subscription to a blog to also automatically send emails of all new comments on that blog. When I follow a blog, I do not necessarily have a comment or reply to make for every primary post (at least not immediately), but I want to see the comments of others as they appear. Support for comment subscriptions will be coming soon. Why not just point people to Google Reader?